Passage of the Physician Assistant National Certifying Examination (PANCE) is the first step in the post-graduate process that requires the PA to continue with medical education and log a specific number of hours during each of three consecutive two-year terms. The PA is required to log 100 hours of Continuing Medical Education (CME) during each two-year period. The six- year period ends with the PA passing a recertification test called the Physician Assistant National Recertification Exam (PANRE). Prepare with our PANCE Study Guide and Practice Questions. Print or eBook. Guaranteed to raise your score. Get started today! The PANCE is administered by the National Commission on Certification of Physician Assistants upon graduation from an accredited medical facility. There are 200 test sites available throughout the United States. The examination consists of 360 multiple-choice questions on medical and surgical subjects. Passing the PANCE allows the physician assistant to use the certification title PA-C (Physician Assistant – Certified), but the PA must also be licensed by the state in which the practice is maintained. The NCCPA maintains a list of accredited institutions on its website. The various state licensing agencies are also listed with contact information for the various medical licensing boards. The PA candidate should register for the PANCE before graduating from an accredited physician assistant college. However, the examination cannot be taken until all requirements for graduation are met. Registration can be conducted online, over the telephone, or by mail contact with the NCCPA. PANCE Flashcards. 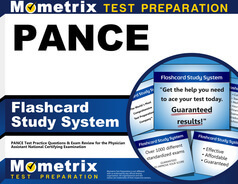 Proven PANCE test flashcards raise your score on the PANCE test. Guaranteed. The PANCE covers broad areas of the medical and surgical fields, so it is important to assemble a wide-ranging library of medical texts during the study process. It is highly unlikely that the PA candidate’s college courses covered every single topic on the PANCE, so it is important to study with some comprehensive works on physiology, anatomy, medical pathology, and pharmacology. The PANCE is an exhaustive test; candidates should be prepared for a grueling six-hour marathon. The 360 questions are broken down into blocks of sixty questions. The successful candidate will set a pace that allows for maximum coverage, with no more than a minute for each question. 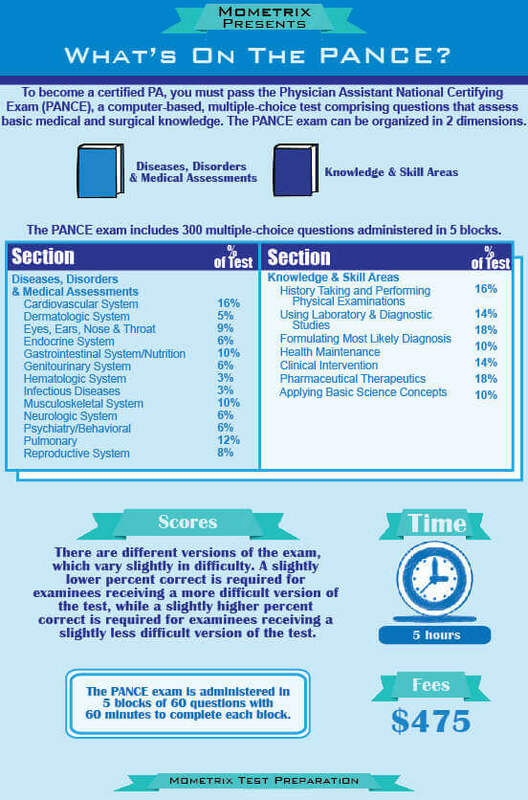 It is best to answer all questions on the PANCE, since correct answers count toward the total score. While there is adequate time to respond to all questions, there is no time to squander. There are short breaks between the sixty-minute blocks allotted for each section of the PANCE, amounting to no more than 45 minutes in total break time.